The best set-up for their substrate is to mix a few of these together. Do not only pick one. Buying the substrate from a pet store, landscaping or home improvement store is your best bet to get the highest quality. If you collect your substrate out in nature there is a chance that it is contaminated with animal droppings, pesticides etc. If you choose to do this examine the substrate closely and wash thoroughly for any possible hazardous contaminants. Outdoor housing requires less cleaning of Horsefield droppings and dirty substrate than indoor. On an as-needed basis, scoop out droppings and replace substrate. 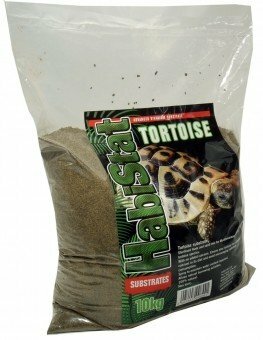 Substrate is important for indoor housing and provides your tortoise with a good footing and temperature regulation just like it does for outdoor housing. Refer to the previous list on substrate in the outdoor section with the exception of grass since it will not be growing in your indoor housing. In addition, for indoors you can use shredded newspaper and remember to mix a few together. With an indoor housing, Horsefield droppings and dirty substrate will need to be cleaned more often than outdoor. Expect to maintain, replace substrate and scoop out droppings everyday to every other day. Also be sure to clean the enclosure, water dish, and food area with a disinfectant several times a week. For outdoor housing it can be formed from dirt mounds if there are currently none. Using a shovel you can redistribute the dirt to make elevation changes. The mounds should be 7-20 cm high and sloped gradually enough for your pet to get to the top and down with ease. When making dirt mounds make sure to not leave ditches where you gather dirt. For that reason, a rake also works well. Horsefield tortoises love to climb and so for another type of elevation change rocks (or anything else they can climb onto) are a great idea. Scatter a few of these items around the housing so your pet can climb around on them. Make sure they are not too extreme that your tortoise will easily get rolled onto his back or injure himself. This will provide a change in elevation to simulate the wild life and temperature differences that your Horsefield would experience outdoors. Simply use your hands to push together substrate to make elevation changes. Make 1-3 mounds. Make one mound next to the lamp, as this will be your basking spot.